Ready, Sketch, Go! is a series of self-paced online classes taught by Tracie Claiborne and Crafty Jen Schow. This bundle includes a total of over 27 hours of video instruction plus 5 hours of audio discussion: that's 32 hours of inspiration and instruction for your enjoyment! Ready, Sketch, Go! Volume 1 This class is packed with sketches, inspiration, and video instruction. Upon purchasing this class, you will receive immediate access to a welcome PDF with a link to enter the classroom, 15 lessons complete with 15 sketches and 30 process videos equaling 10.5 hours of video instruction, 40 layouts to inspire you, 17 exclusive cut files in PNG and SVG versions for use with an electronic die cutting machine, 2 hour audio discussion with Jen and Tracie discussing their approach to each sketch, 25 page printable .pdf document with full color photos of each sketch and layout + tips and tricks perfect for printing and taking to a crop PLUS spaces to create your own sketches, access to a private Facebook group where we will discuss ideas, share projects, and ask questions, email access to both instructors. Ready, Sketch, Go! 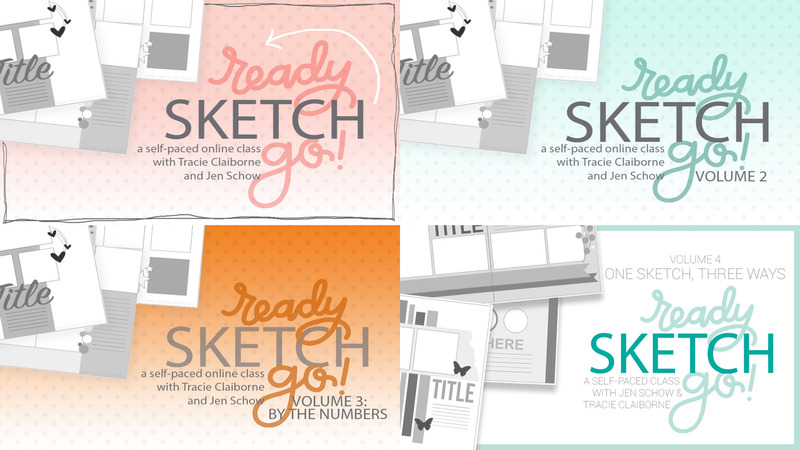 Volume 2 The follow-up to Ready, Sketch, Go!, this class features 15 NEW sketches with 30 new videos and layouts! You'll receive access to a welcome PDF with a link to enter the classroom, 15 lessons complete with 15 sketches and 30 process videos equaling 8 hours of video instruction 35 layouts to inspire you, 16 exclusive cut files in PNG and SVG versions for use with an electronic die cutting machine, bonus audio discussion with Jen and Tracie discussing their approach to each sketch, 20 page printable .pdf document with full color photos of each sketch and layout + tips and tricks perfect for printing and taking to a crop PLUS spaces to create your own sketches, access to a private Facebook group where we will discuss ideas, share projects, and ask questions, email access to both instructors. Ready, Sketch, Go! Volume 3 This class is packed with sketches, inspiration, and video instruction. Upon purchasing this class, you will receive immediate access to a welcome PDF with a link to enter the classroom, 7 lessons complete with 7 sketches and 14 process videos equaling over 3 hours of video instruction 20 layouts to inspire you, 27 exclusive cut files in PNG and SVG versions for use with an electronic die cutting machine, one hour bonus audio discussion with Jen and Tracie discussing their approach to each sketch, 10 page printable .pdf document with full color photos of each sketch and layout + tips and tricks perfect for printing and taking to a crop PLUS spaces to create your own sketches, access to a private Facebook group where we will discuss ideas, share projects, and ask questions, email access to both instructors. Ready, Sketch, Go! Volume 4: One Sketch, Three Ways This class is the fourth in a series called Ready, Sketch, Go! Ready, Sketch, Go! Volume 4 is a self-paced online class taught by Tracie Claiborne and Crafty Jen Schow. In this volume of Ready, Sketch, Go! we translate each sketch into an 8.5x11 page, 12x12 page and a double 12x12 layout. We think you'll be surprised to find that one sketch design can go a long towards inspiring you! We can't wait to show you how! The class is packed with sketches, inspiration, and video instruction. Just a note: You have 5 attempts to download files that are sent to you via e-mail. Please bookmark the classroom page upon entry so you can easily return as often as you'd like.